The Clintons were back on the Great White Way again last night! The Band’s Visit is a charming, feel-good story that is exactly what we need right now about an Egyptian police band accidentally stranded in an Israeli desert town. Tony Shaloub stars. Hillary Clinton & Hubby Bill Check Out Performance of Broadway’s ‘The Band’s Visit’! Broadway got a visit from some special guests last night (December 27)! Hillary and Bill Clinton had themselves a night out with daughter Chelsea Clinton to check out a performance of the hit Broadway musical The Band’s Visit held at The Barrymore Theatre in New York City. 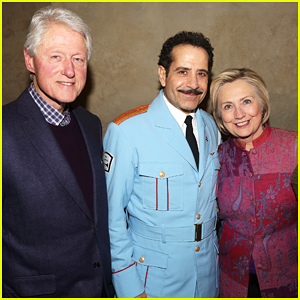 Following the performance, Hillary and Bill made their way backstage to meet with the stars of the musical Tony Shalhoub and Katina Lenk, as well as the rest of the cast.